If you haven't already seen my tutorial, here's a hint: you don't have to be a good painter to make them! I used my mom's Cricut for them. And, it's so easy and ends up looking so cute. I'm planning on making more with MY NEW SILHOUTTE which should be here tomorrowwwwwwww. so.excited. So, anyway, head on over to Ladybug Blessings and check it out. And, link up to her linky party while you are there! Thanks for linking up! I'm a new follower! Those canvases are so cute! Cute! Yet another thing to go on my crafty "to-do" list. Thanks for the idea. 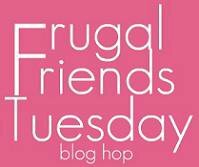 Thanks for linking up at Frugal Friends Tuesday. I'm following you! 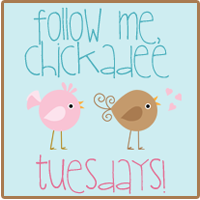 New follower from Follow me Chickadee! Fellow crafter here, and I love your tutorial!